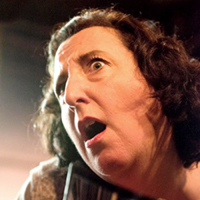 Fab, Funny & Fierce follow Fran on this fast-paced frolic as she finagles words like Fat, Forty, Forgotten & Ferocious! Yvette is widely imaginative in her use of sets and props. She uses three silks to channel her inner Greek fates that twist and turn her life about. The silks are used throughout the show to represent many things. She made me laugh and cry as I felt for her moments of loss, self doubt, and worthlessness. I liked how she differentiated the characters. She completely changed her body and became someone completely new. The writing was decent but I found some of the songs and scenes regarding ‘alone time’ to be way too forced. They were awkward and quickly became unfunny especially the grandma masturbation song. They were not fun to sit through and I just wanted them to be over. They do have a place and purpose in the show but I felt they could have been handled better. This journey that is unapologetically feminist, is certainly not for everyone but it’s a fun way to spend an hour.